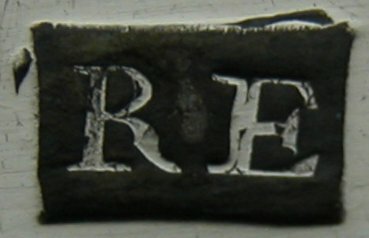 Richard Evans is recorded as a Shrewsbury maker, registering a mark on 3rd May as a small-worker. He was admitted to the Company of Mercers, Goldsmiths etc. of Shrewsbury in 1780 and was a Burgess of the town that same year. 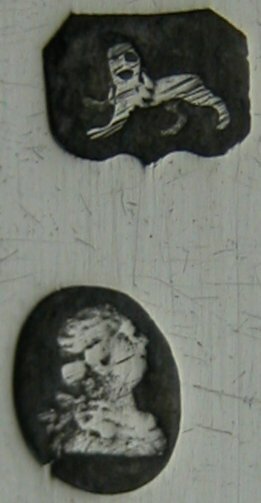 The only address recorded, (at Birmingham Assay office), is Shrewsbury. A second mark was entered in 1787. 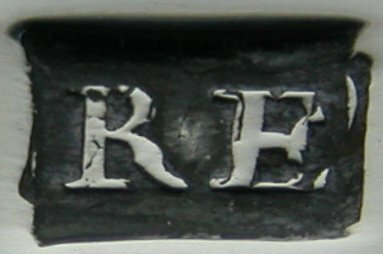 There is no mark of "RE" entered in London as far as we know. The reason that this is interesting is because of these sugar tongs. Both pairs of tongs are marked "RE" for Richard Evans, both have standard London hallmarks for the period 1786 to 1790. Also with a close examination, it is clear that both have the maker's mark over-struck. From the overall style of these tongs, they look very like they came from the Bateman workshops and from the date, they would be Hester Bateman. A picture is beginning to build up, of the Batemans potentially supplying several of the provincial makers with London sugar tongs, (seeThomas Ollivant). Was Richard Evans another provincial maker who bought his tongs from Hester Bateman to sell, either in his London retail outlet, (if he had one), or back home in Shrewsbury?